Ithaca, NY: Cornell University Press, 2008. Please visit Cornell University Press or Amazon to order. Böhm, Andreas (2009) Aussenwirtschaft: Zeitschrift für internationale Wirtschaftsbeziehungen, Vol. 64, No. 2. Bernhagen, Patrick (2009), Journal of Public Policy, Vol. 29, No. 1, p. 127-130. Bastianutti, Julie (2009), „Des intérêts mal compris,“ Sociétal, No. 65/3. "Firm Interests is theoretically ambitious and empirically rich. Political economists typically take the notion of an actor's interests as something to 'do the explaining with' rather than 'something to be explained.' Yet essentially similar material environments seem to engender great variation in the interests real actors hold. Rather than ignore this inconvenient truth, Cornelia Woll confronts it head-on in a major contribution to constructivist scholarship in political economy. 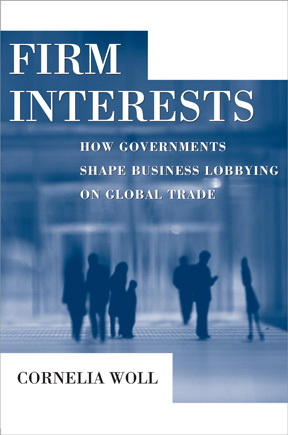 Firm Interests shows how actors as diverse as telecommunications firms and airlines can hold interests that cannot be assumed from their asset-baskets or sectoral positions. Rather, firms actively construct ideas about what their interests should be given their interaction with other agents. Firm Interests puts the study of what actors want on much firmer ground."